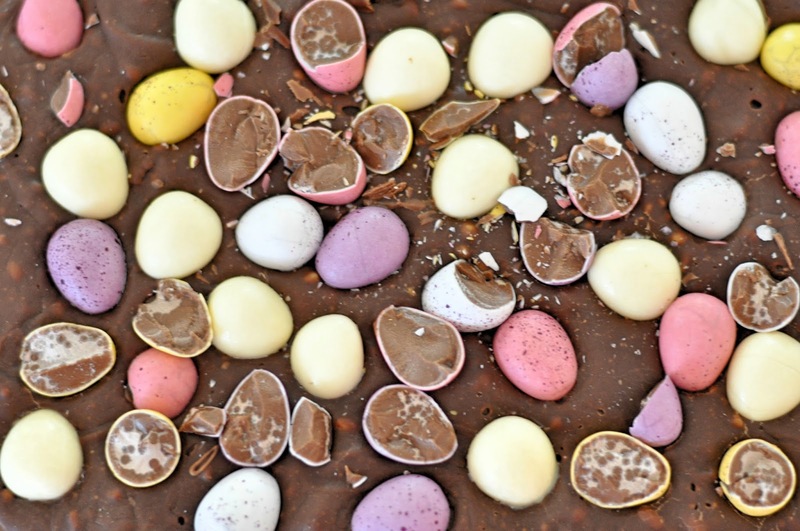 If you've got to this part of the Easter weekend and you actually have some eggs and chocolate going spare, then I salute you. b) make a very good effort of eating it all within a week. This includes playing swapsies with family members to get extra creme eggs in return for your big Mars egg. c) use one of these recipes to turn them into something entirely new, and if you're feeling particularly festive, share them around. In a large heatproof bowl, gently heat all ingredients in the microwave in short 20 second bursts until melted. Mix together until smooth. Line a tray with foil or baking parchment and pour the mix in. Give the tray a few taps on the sides to knock out any air and smooth over the top. Scatter your toppings over and leave to cool in the fridge for 1-2 hours. Once fully firm, slice into small squares to serve. In a large heatproof bowl, heat 3/4 of the chocolate over a pan of barely simmering water. Whilst the chocolate is melting, line a large baking tray with baking parchment. 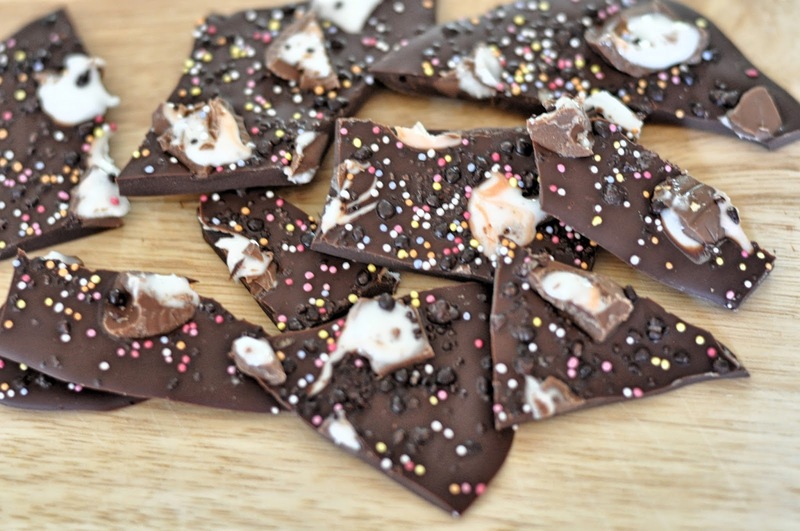 To temper the chocolate, melt only to 43C for white chocolate and 45C for milk and dark chocolate. Once the chocolate has reached this temperature, remove from the heat and add the remaining chocolate. Stir using a spatula until the rest of this chocolate has melted and the temperature cools to 28C for white and milk chocolate and 30C for dark chocolate. Once the chocolate has reached this stage, pour into your prepared tray and give it a wiggle to cover all corners of the tray. Scatter with your toppings and leave to set at room temperature. Once set, snap into shards. In a heatproof bowl, heat 3/4 of the chocolate over a pan of barely simmering water. 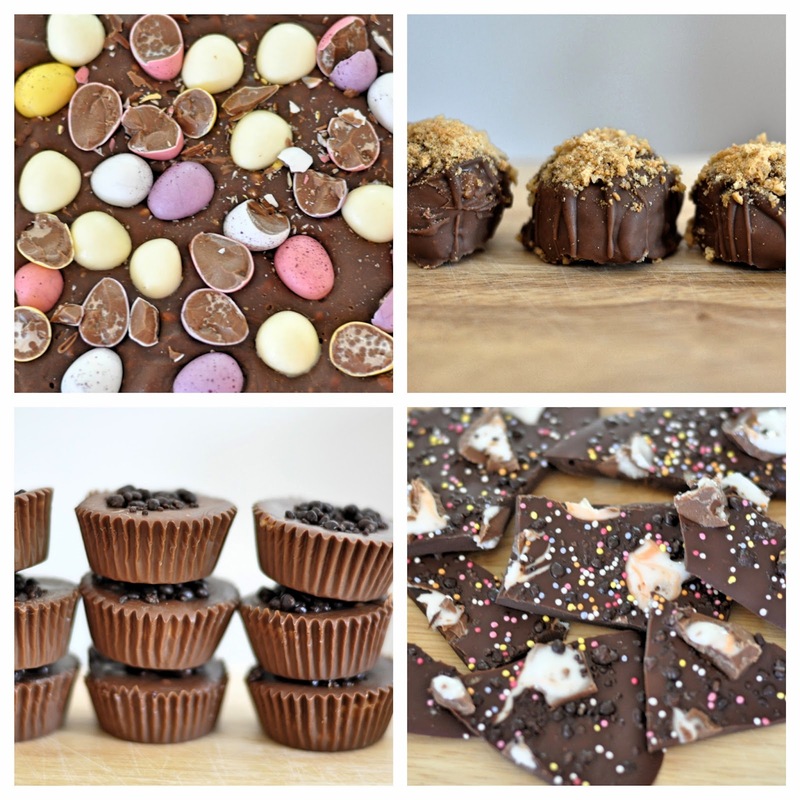 Whilst the chocolate is melting, set out paper cupcake cases onto a plate or tray. Temper the chocolate using the instructions above. Divide around half of the melted chocolate between the paper cases. Lift the tray up and gently drop on your work surface a few times to knock out any air bubbles. Use a small spoon to work the chocolate around the sides of the paper cases. Pop in the fridge for 10-20 minutes to let the chocolate firm a little. In a blender, mix together the peanut butter and icing sugar until a smooth paste forms. 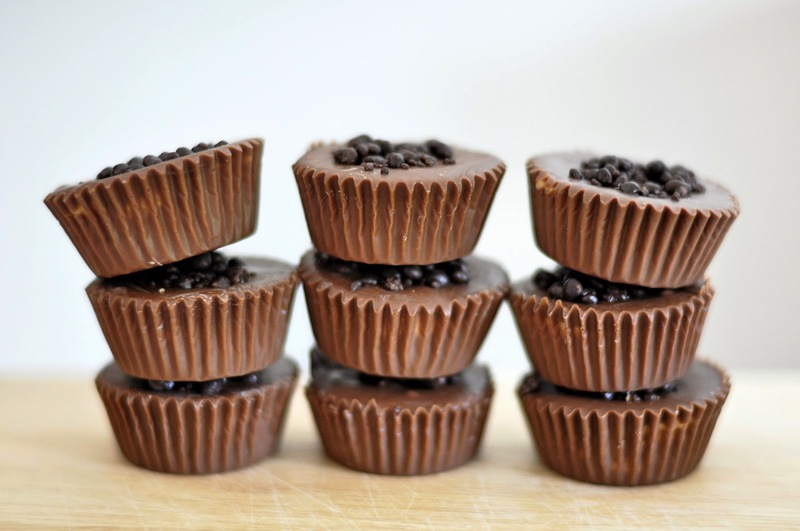 Once the base layer of the cups has start to firm, spoon or pipe the peanut butter evenly between each. Pour over the remaining chocolate and smooth over the tops with the back of a spoon. (If this chocolate has started to firm, gently heat once again until it loosens). 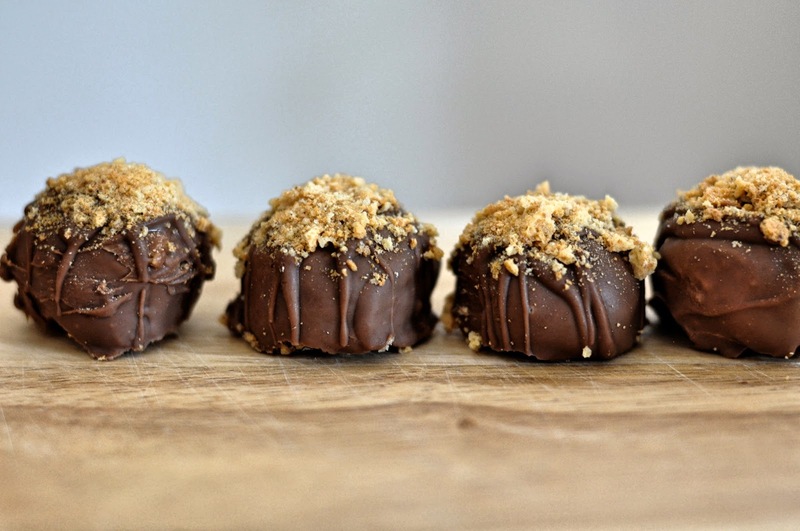 Leave at room temperature for the peanut butter cups to full set before serving. In a blender, pulse the biscuits until fine. Mix in a bowl with the cream cheese. Using a small ice cream scoop, or two spoons, scoop balls of the mix and drop onto a tray covered with foil or baking parchment. Freeze for 10-20 minutes until firm. Place the cheesecake balls onto a wire rack over a tray. Drizzle over the melted chocolate so all edges of the truffles are coated. Top with more biscuit crumbs or sprinkles. Milli Taylor's chocolate bar cake, if for some reason unknown to most, you have a whole heap of chocolate bars leftover then this is the recipe for you. Think Munchies, Maltesars, Flakes, Bountys, Crunchies, the works! Sarah from Taming Twins' recipe for Cadbury's caramel eggs croissants...this would also be great with creme eggs. Larissa makes Choc-tails on Drop Dead Gorgeous if you're looking for something more boozy!